Is YouTube throttling video downloads now? A few months ago, Google made some changes to YouTube; they changed how the buffering works and removed the stop download command. Rumors abound that it was because Google was having bandwidth shortcomings in YouTube (not surprisingly since videos are large and popular, and everybody feels the need to post videos about absolutely everything now). For about the same period, I’ve noticed that downloading a YouTube video seems to be throttled. Downloading a video (in whatever manner you usually download YouTube videos) tops out at ~38.5Kbps. The download maxes-out at ~77Kbps, but drops to 0 every other second, resulting in the average seen above. The download stops completely every so often (~10 or so minutes) for about 1 minute, then spikes for a couple of seconds and resumes at the throttled rate. Watching a video in YouTube seems to have no effect; the bandwidth meter shows it streaming the video at higher than the aforementioned limit. Below (figure 1) is a bandwidth graph where the only network activity (other than bringing up this webpage) is a single YouTube video being downloaded in the background. It clearly shows the download being throttled. The question is whether this is YouTube’s work or the ISP’s. Admittedly, my current ISP, Rogers, is infamous as the “world’s worst throttler” and has continuously defied CRTC orders and continued to throttle even when they said they stopped, but that is mostly for P2P traffic, not HTTP traffic. What’s interesting about this is how it can even be differentiated that a video is being downloaded or streamed. I suspect the key is in the speed at the beginning. If it detects that the video is transferring “too fast”, then it assumes it is being downloaded, so it starts throttling it, otherwise it continues at “full” speed. However the expected speed depends on the resolution of the video, which is what makes me suspect that this is YouTube’s work since they are the ones who have access to that information. 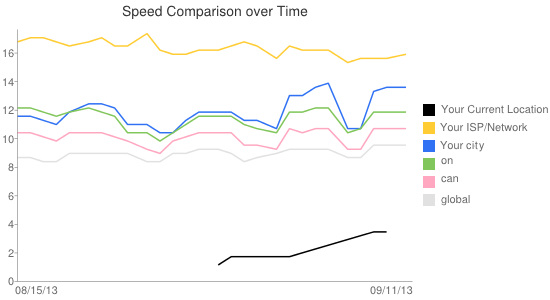 Also, I find YouTube’s built-in bandwidth chart (figure 2) quite curious. It shows that I have been getting an extremely low throughput with YouTube. I suspect that it is off because YouTube behaves differently under different circumstances. For example, I have watched a few videos on YouTube in the past few weeks, but generally jump around (usually skipping forward) as opposed to just sitting there watching the entire thing (most of the recent videos were informative, not entertainment). In addition, most of the more recent videos I’ve watched were lengthy (10+ minutes instructional videos which I absolutely cannot watch “normally”; if I sat there for an hour watching a boring video at 1x speed in the web page, I would (possibly literally) explode, so I had to download them so that I can view them in VLC at 1.5x speed in the corner of the screen while I worked on other things. Unfortunately, at 38.5Kbps, it takes as long to download the video as it does to watch it, which defeats the purpose, and I think that may be key: the download speed might vary in order to make it take as long to download as to watch it. Does anyone know whether YouTube has started throttling downloads? Does anyone know how YouTube downloads from around the world behave or whether Rogers does indeed throttle YouTube traffic? Any information or observations are welcome because the more data we have about it, the clearer the picture becomes (though sadly, it probably doesn’t really change the end result, but at least knowing what’s what can allow us to accommodate and work-around it). This is a result of a bad downloader rather than YouTube throttling. In DASH (which is what the new tech is called they're now using), a video is not just a single file that gets lobbed your way when you watch it, instead it gets sliced up into small parts a few seconds long each, so things like changing quality and adapting to a changing bandwidth (which is quite common, considering that the majority of users are using mobile devices now) go more smoothly. There is a pitfall in this however: Whenever you open a connection via TCP, the download speed builds up over a few seconds before it reaches the maximum download rate, you can observe this effect quite nicely on http://speedof.me. Combining both things now leaves you with small files that all need to build up their download speed first, but after just reaching a speed of 100 kbit/s, they're already done, the connection closes and a new connection opens to download the next tiny file. The solution for this sounds rather trivial: The downloader just has to keep the connection open instead of opening ever new ones. Which probably is what modern downloaders do. if I sat there for an hour watching a boring video at 1x speed in the web page, I would (possibly literally) explode, so I had to download them so that I can view them in VLC at 1.5x speed in the corner of the screen while I worked on other things. This is possible on YouTube itself now in any modern browser btw. YouTube may be throttling its own videos. I can load all their front page material just fine. If I try to load a less viewed video and run it concurrently with a number of front page videos, the front page videos will stream perfectly and the unpopular barely viewed video will stutter and stop while continuing to buffer. Not the answer you're looking for? Browse other questions tagged youtube bandwidth video-download or ask your own question. Check to see if you've viewed a YouTube video before? Does bandwidth consumed while watching YouTube depend on screen size? YouTube account suspended, what now? How an I see what percentage of viewers watch to the end of my YouTube video? Why doesn't YouTube automatically select a higher video quality if I have excellent Internet connection? Remove “Recommended for you” from YouTube related video sidebar?